high speed WiFi! Thanks to a generous donation. Cheriton Village Hall Committee is pleased to announce that the purchase of the Hall from the Church was completed on 25th June 2018. 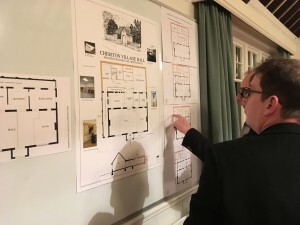 Its efforts will now be to raise funds for the Hall's improvement and extension. A planning application was submitted by our architect, Paul Masser, to the South Downs National Park and approval was obtained in February 2019. Cheriton Players generously organised a RACE NIGHT in aid of the village hall on Friday 1st March as per the poster below, and which raised a magnificent £920 towards the Hall's improvement fund. In my many years of working here, I have come to find that every village in Hampshire seems to have that community spirit that has somehow been lost elsewhere. Cheriton is no exception, the village hall is the heart of that community. And so it was that Winchester Today paid yet another visit to this extraordinary place to find out more about a fundraising scheme on a grand scale to purchase the freehold from the Church. The freehold would then be held in trust for the benefit of residents. 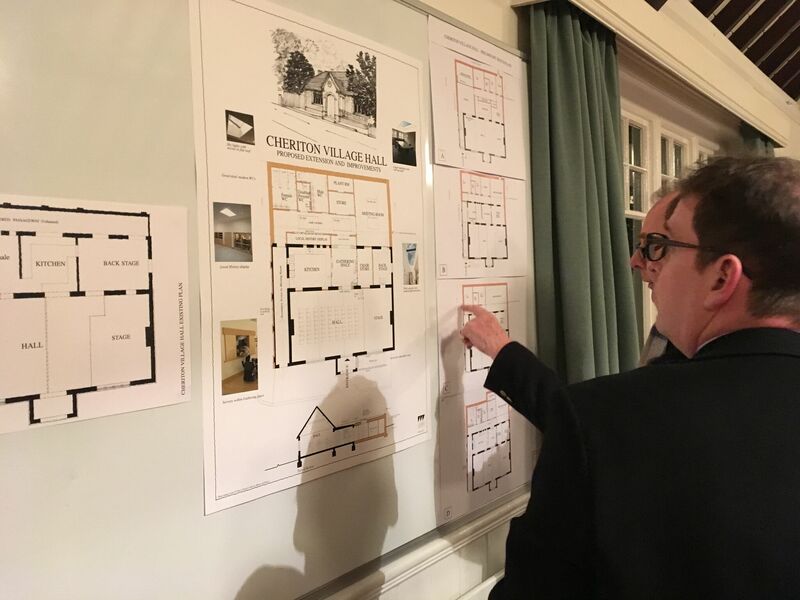 Once this has been done, it will be much easier to attract grants – and let’s face it, the hall is in need of repair. Founded in 1911, it’s clear that many aspects of the hall are now way beyond their sell-by date. Outside, the elements looked like they were celebrating too and were determined to liven up proceedings – with thunder and lightning illuminating the skies around Cheriton, with torrential rain and even a short power cut! 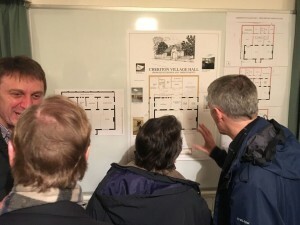 In an exclusive interview for Winchester Today, the Chairman of the Cheriton Village Hall Committee, William Beardmore-Gray, explained to me why he called the event a celebration when he addressed the crowd: “A lot of people have spent a lot of time getting us to where we are now. It’s probably taken four or five years of negotiation getting us to where we are now. 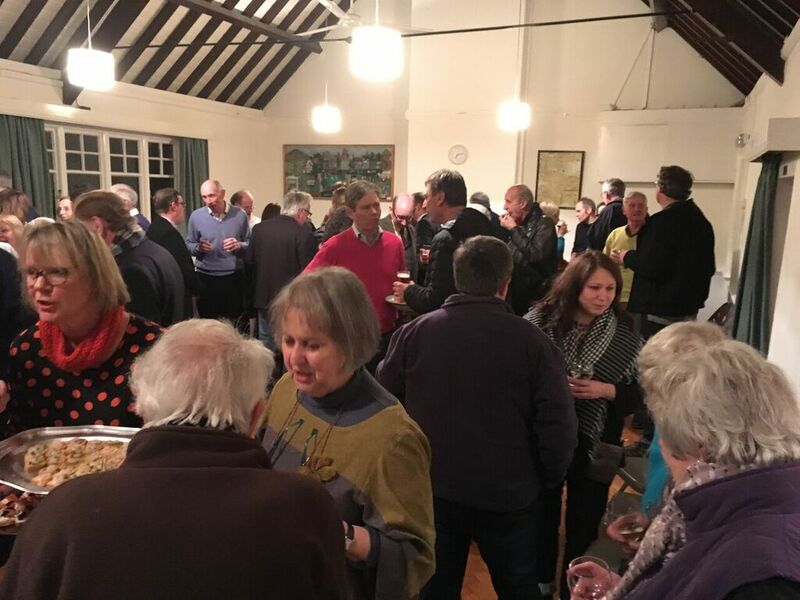 “It’s a celebration because we’re about to exchange contracts on buying the village hall – which secures its future in the heart of the village. Here’s a list of what needs to be done: improve the layout, improve the access both inside and outside, better toilet facilities, better natural lighting, better storage facilities, upgrade electric lighting, improve the stage area, provide a new kitchen, provision of an in-house PA system and roll-down screen, improve safety and security, improve insulation, provide a new environmentally-friendly heating system, install solar panels, air conditioning, improve drainage, install broadband – and anything else they can think of!